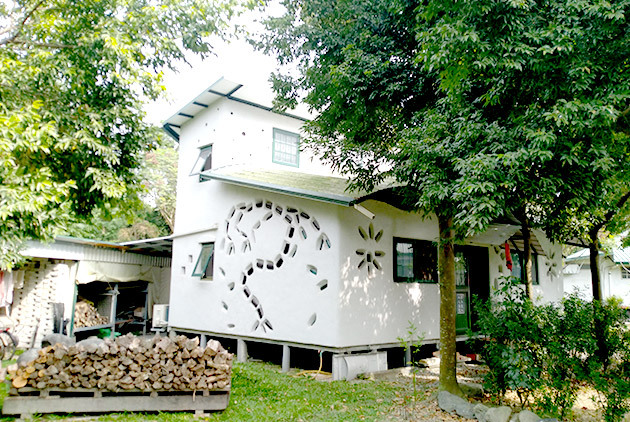 In Pingtung there is a “gingerbread house” that features a split-level design, a sloped roof, small windows and a decorative façade design in the shape of a winding vine. However, this gingerbread house is not the baked kind with frosting you typically encounter during the Christmas holiday season. This two-story house that looks just like a “gingerbread house” is inhabited by people. 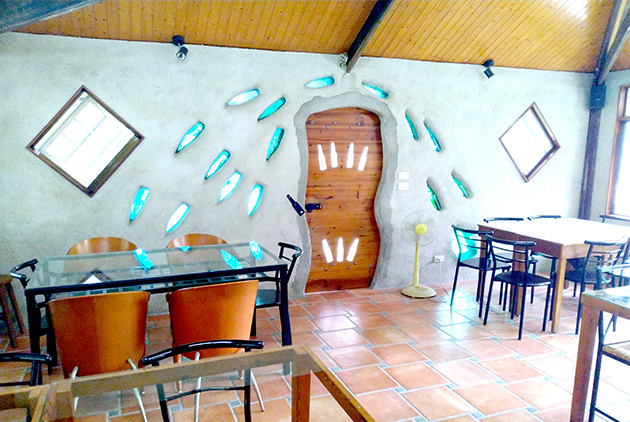 And it has been constructed with papercrete brick, PET bottles and other recycled materials by Canadian-born John Lamorie, who is owner, architect and builder all in one. Lamorie, who just turned 69, came to Taiwan 20 years ago. In 2017, he formally renounced his Canadian nationality to become a naturalized Taiwanese citizen. Last year, he voted in Taiwan for the first time. “I thank Tsai Ing-wen for giving me the best birthday gift,” says Lamorie, alluding to the scheduling of the local elections which fell right on his birthday. 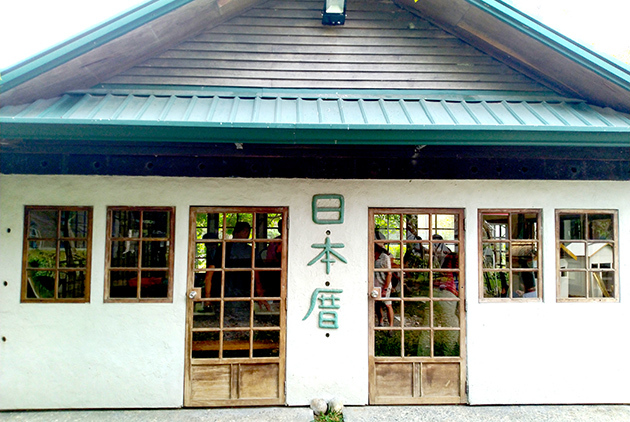 DaMorLee Leisure Farm in Ligang is the home of this “new Taiwanese”. Coming from Gaoshu Bridge at the boundary between Kaohsiung and Pingtung counties, you will have to drive on small country roads to find it. The farm lies at the end of a narrow winding road that leads past lemon trees and areca palms. A low white wall surrounds a huge expanse of green land with an artificial pond in the shape of Taiwan. The farm boasts an array of several houses, shaded by large trees, each with a different name. There is the “Paper House”, “Belly House”, “Japanese House” and, of course, the adorable gingerbread house, which actually goes by the name “Starship”. This countryside getaway, which Lamorie began to build with his Taiwanese wife Shelly Wu some ten years ago, is a leisure farm that is open to the public. Visitors can participate in a papercrete brick-making workshop or try their hand at pizza- or bread-making. You can, of course, also come simply to have a meal, stroll across the property, row a boat on the lake that Lamorie dug himself, or enjoy the tropical setting on the swing. “I built this farm together with my wife from nothing. I also designed each house myself and built them all with my own hands. 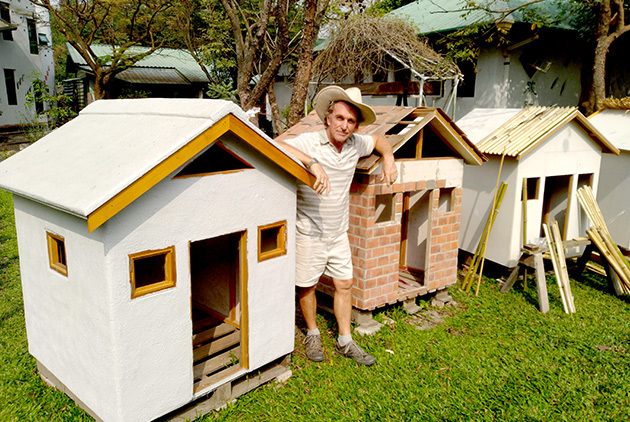 They were all built with papercrete bricks and other waste materials,” says Lamorie. So, what are papercrete bricks? As the name suggests, they are made from old newspapers and cement mixed in a 1-to-1 ratio before water is added. The mixture is then poured into molds made from waste wood, and empty PET bottles are placed in the center. When the cement has set, after about 20 minutes, the molds are removed from the bricks, which are left to harden overnight before they are moved to another place to dry in the sun. If the weather is fine, the bricks are ready for use within 7-10 days. The PET bottles inside the bricks have an insulating effect because the air trapped inside cannot move and can therefore not conduct heat. “In this way, these empty bottles will never become plastic waste in the ocean,” remarks Lamorie. Thanks to these bricks, building a sustainable “green building” with your bare hands, without high-tech, and while reducing plastic and other waste is not a fairy tale. But can you really live in such a house? The proof is in the pudding. Since 2009, when the first house, the Paper House, was built countless typhoons and earthquakes have hit Pingtung, but not a single building on the farm collapsed or suffered major structural damage. Lamorie explains that the walls must be coated with silicone paint on the outside to make them waterproof. The roofs are designed with wide overhangs to protect walls and windows from rain. A house built with papercrete bricks weighs only 10 percent of a conventional cement building which is why such houses withstand earthquakes better and do not collapse. “For this door I had to drink that many beers,” says Lamorie jokingly as he points to a wooden door embedded with seven empty Corona beer bottles made from clear white glass. Lamorie is always scouting for materials that can be reused or recycled. Sometimes he stumbles across something by accident; sometimes friends introduce him to potential sources, or he buys items from recycling yards. All kinds of materials can be salvaged from model homes that are dismantled after a construction project has been sold, homes or schools that are being demolished, and even abandoned hog sheds. The wooden door and window frames in the Japanese House, for example, were rescued from a nearby old Japanese-style building that was demolished. Lamorie, who attaches importance to protecting the environment and likes to reuse resources, feels that, while environmental awareness has risen among Taiwanese, no comparable progress has been made in terms of valuing the material things we have. People customarily replace things they have used for a while with new stuff. “It’s probably because people were poorer in the past but now can throw out things to buy new ones, so it seems to be a symbol of affluence,” Lamorie postulates. That Lamorie values things and resources so much can be attributed to his childhood and upbringing. His father was in the military, and the family lived in a small town in the Canadian Arctic that did not have a single store. The food was replenished once a year by the army so they needed to be self-suffiencient. Anything that might have a future use in the future, therefore, was kept. Lamorie also learned many DIY skills so that woodworking, electric welding and other handiwork are easy tasks for him. “I also put this machine together from different parts that I bought because the supplier that I found at the time said I needed to order ten at a time. Since I needed only one machine, I just made one myself,” says Lamorie as he operates a large electric wood cutting machine in front of his visitor. Lamorie did, of course, not come to Taiwan planning to build a house. Like many other foreigners, he landed a job in Taiwan as an English teacher. After graduating from university in Canada, Lamorie travelled around the world taking various jobs that came along, be it a bartender, ice cream seller, sales agent, or even male stripper. 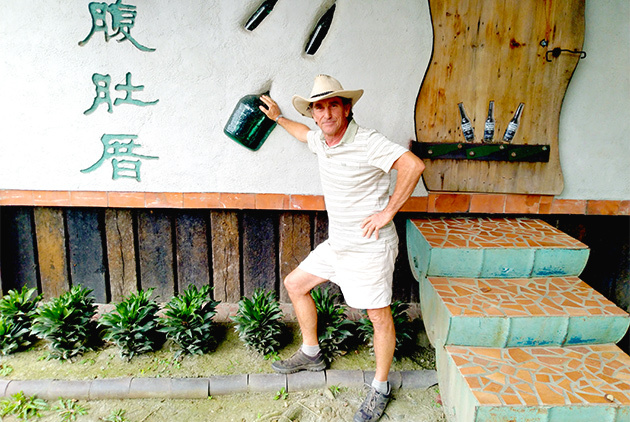 After living in New Zealand for an extended period (which is why the flags of Taiwan, New Zealand and Canada have been put up at the farm) he still pined for his old nomadic lifestyle. Originally, he wanted to travel to Japan, but finding a job as an English teacher there proved more difficult than he had expected. A Taiwanese in New Zealand encouraged Lamorie to look for work in Taiwan. After sending out his CV, he got 20 job offers from Taiwan the next day. The local language school where he took a job after arriving in Taiwan in 1998 assigned him to their branch in Yunlin. Back then he knew little about Taiwan. His only encounter with people from Taiwan dated back to the Expo 1967 in Montreal where he met a group of Taiwanese Boy Scouts. As it happened, a Taiwanese in central Taiwan who belonged to the 51st Club of Taiwan (which advocates that Taiwan become the 51st federal state of the United States of America) asked Lamorie to help with some of the English translations of their version of Taiwanese history. “Within two weeks, I knew Taiwanese history, which is probably more than most local people know,” Lamorie claims with a chuckle. Originally, Lamorie was planning on staying for two years and then resuming his nomadic traveling, but since he met the woman who is now his wife, Taiwan turned from a transit point in the journey of his life into the destination. The couple moved to Pingtung, the home county of his wife, and opened their own English language school. In 2006, they bought the property where the farm is located, which originally was planned for weekend retreat only. The Paper House was built on suggestion of an American friend. After some research on the Internet, Lamorie built the house with his own hands. The house accidentally drew the media attention and ensuing crowds who wanted to visit. 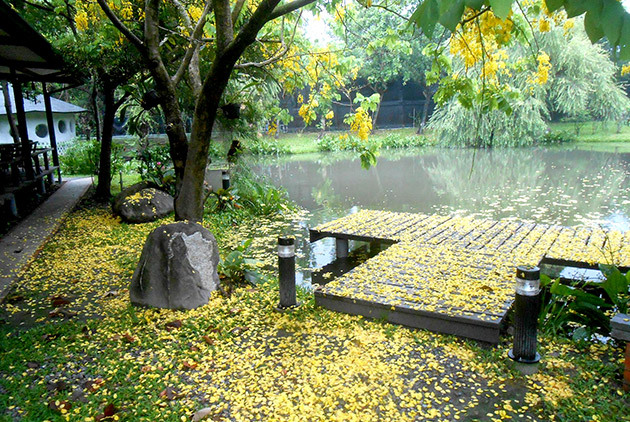 Eventually, the couple, surprised at the development, sold their language school to turn their weekend haven into a leisure farm, sharing the beauty of its natural setting with visitors from around Taiwan. “When we close at 5 p. m., I drink a beer with my wife, we watch the sunset, the teals swimming on the lake and the birds flying in the air. It is a very simple life. I don’t want to move anywhere else anymore, I want to spend my last years in Taiwan,” says Lamorie dreamily, sitting on the wooden porch. It might be this quiet satisfaction that made Lamorie settle down. He says the friendliness and tolerance of the Taiwanese give him the feeling of having come home. While Lamorie does not speak Mandarin that fluently, he has no problems communicating his needs even in the most local hardware stores. If the owner does not understand his Mandarin, he gets his message across with lively gesturing. “My Mandarin is not good, but I don’t have a problem communicating,” says Lamorie. While this seems contradictory, Lamorie’s experience reflects the accommodating attitude of the local people. A few years ago, a sand and gravel processing plant opened in the farm’s neighborhood, illegally using agricultural land. The operations cause airborne dust, noise and pollute local water sources. Lamorie is also furious that, as narrow industrial roads are frequented by heavy gravel trucks, access to the farm from public roads has effectively been blocked. He has flooded government agencies — including the Ministry of the Interior, the Council of Agriculture, the Environmental Protection Administration — with letters reporting the offense, but to no avail. If it’s not the central government passing the buck, saying authority in this issue lies with the local government, then the local government hesitates to deal with the problem or does not touch it at all. In October of 2017, strangers even trespassed on the farm and poured two barrels of asphalt on the house, delivering a clear warning. “Originally I thought things would get a bit better after the Democratic Progressive Party came to power, but it has gotten worse.” Lamorie, who had great expectations when Chen Shui-bian ran for president in 2000, even flying Chen’s campaign flag on his motorbike, can hardly hide his disappointment. Lamorie says when he brings up this matter with Taiwanese friends, they only resignedly shrug their shoulders and say, “This is southern Taiwan,” advising him that no matter how often he files a report with police or protests, nothing will come of it. Lamorie is not giving up yet, because he firmly believes that illegalities and injustices must not be allowed to happen.